Two things notable about the scene are the fact that the guns actually run out of ammo, and the lady actually says “magazine” and not clip. 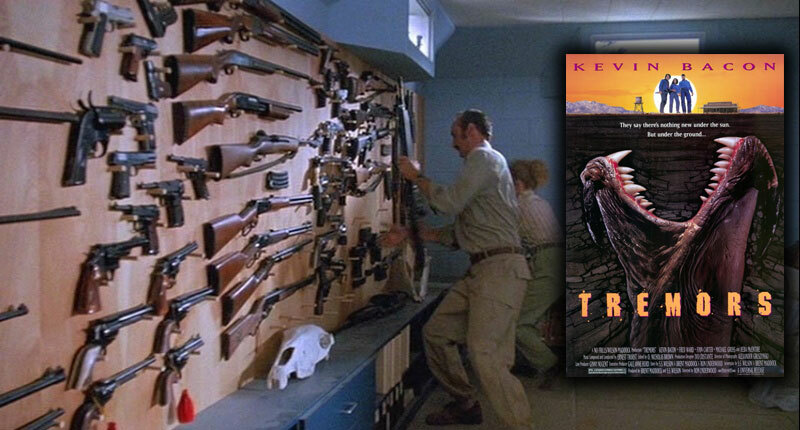 LOL they actually made up to “Tremors 4” … I hate to think how bad the other 3 are. There was also a Tv series. Yeah I always thought it was weird the image they chose for the poster is an image of the worm-like things that came out of the graboid’s mouth. Then again those were much more aggressive looking then the graboid itself. I knew what clip this was before I even clicked! Such a (B-) classic…. That movie was surprisingly good. At the time I thought it was a made for TV flick. It’s great to see preppers get the last laugh for once. I saw it in the theater three times! Rec Room scene was, of course my favorite. Nice detail that it was a shell casing cleaner that drew the graboids to the house. Sequels actually weren’t all that bad. If you do a bit of freeze-frame/slo-mo when Bert breaks open the display case, you can see one of those wood-backed cartridge displays right inside, at the foot of it – neatly arranged from smallest to largest! Blu-Ray version of the film came out not but a few weeks ago. Definitely like this take on a monster film where the locale of the humans makes them a better prepared folk (armed, no strangers to guns), over a bunch of sissy big city teens. God, I remember this growing up. This probably helped turn me into a firearms enthusiast (even though I have no money to even get a plinker, damn poor college student). The other was old anime where people actually died and it had some resemblance of a plot. My favorite Kevin Bacon movie? It’s a tie. Between all of them. haha I just saw that commercial.